I can be impatient. And though it may seem anti-climactic, I have tendancy of revealing projects on this ol' blog while they're still in progress. Like the kitchen and the yet-still-unfinished master bedroom. But what can I say, I don't want to wait until things are perfect and done before I show them to you all - that could take years and then there would be nothing for you to read!! 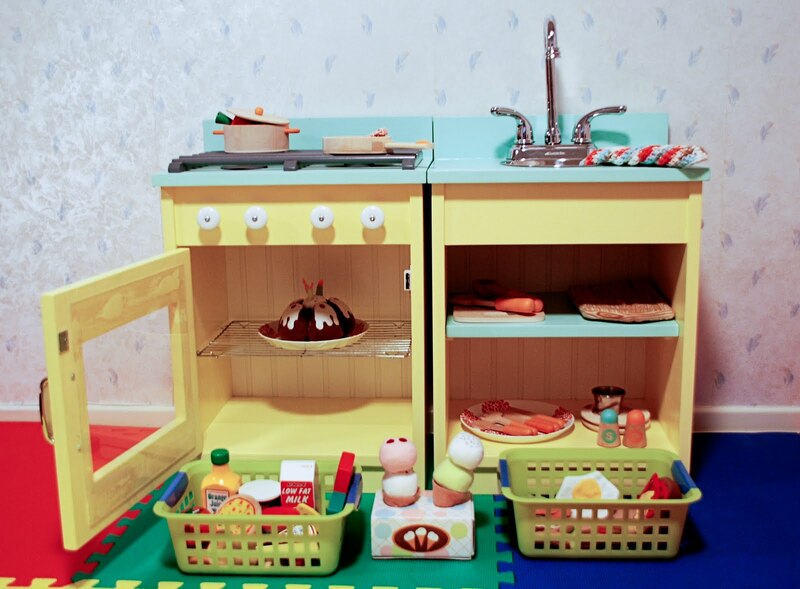 So here's a first look at Chloe's play kitchen!!! Its 2/3 finished... the last piece, the fridge, still needs a few coats of paint and the doors to be hung before its done. (Ignore the ugly wallpaper and tiny baseboards. The play area is in our soon-to-be-redone basement). I am ridiculously happy with how this project turned out. We followed the very easy-to-use plans from Ana at Knock-Off Wood but made a few modifications for aesthetics and function. 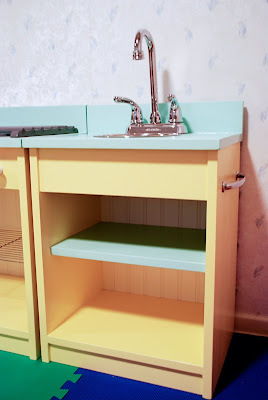 We painted the set in blue-green and marigold yellow (sorry, don't have the paint names handy!). 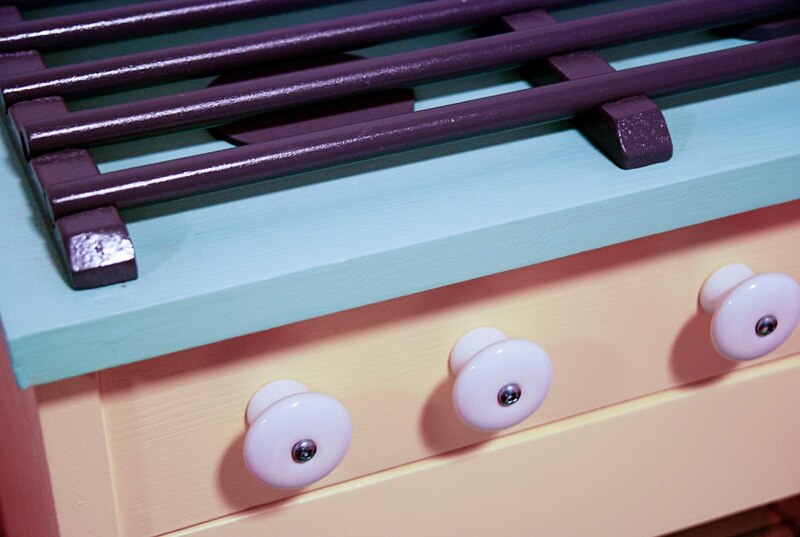 Paired with the chrome handles and ceramic knobs from Lee Valley, it has a bit of a retro 1950's vibe. 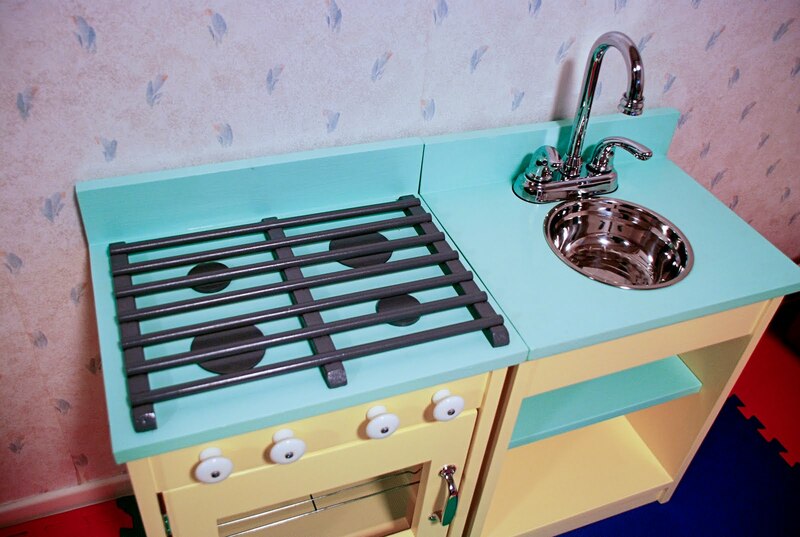 Let's look at the sink a little closer, shall we? 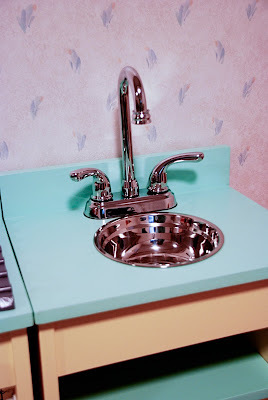 We scored and found the perfect bar faucet at our local Re-Store for $15. For the basin, we used a metal bowl from the Dollar Store. We had a bit of a mishap and cut the hole out too big originally and so had to find another larger bowl. Lesson learned: its easier to cut a smaller hole and sand or rasp down the sides until its the right size than to cut a too large hole! We recessed the top face panel and the toe kick just for a bit of interest. Then we added a beadboard backing and a long handle for a tea towel I will eventually sew up. Then there's the stove! Since we have a gas stove, we decided to make this a mini-gas stove too. Creating the grill was pretty easy. HandyMan took a 1"x2" piece of wood and drilled holes down the centre the same diameter as the dowelling. Then he cut the wood in half along the length and was left with two pieces of wood with semi-circle cutouts. He angled the ends to make sure there were no sharp corners. The burners are little wooden disks we found at Michael's. 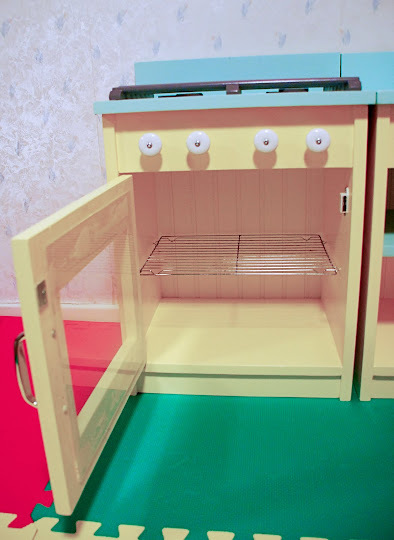 My favourite part is the oven! 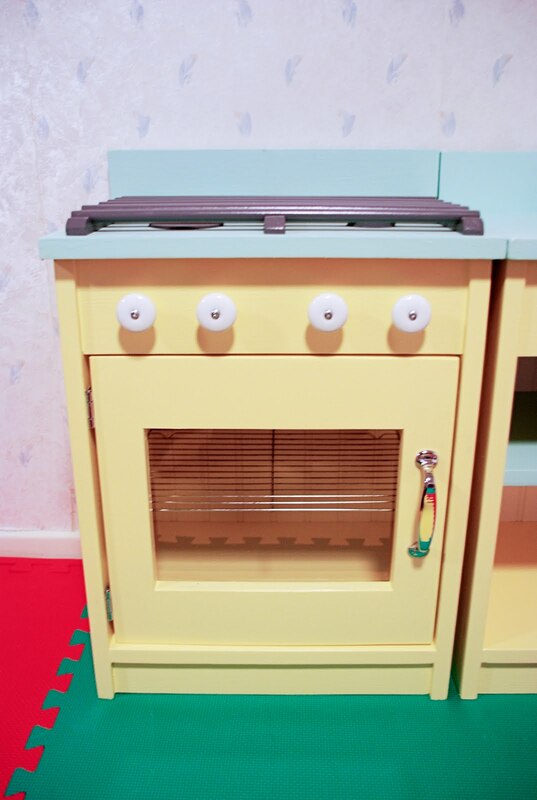 The plans show the oven door hinge at the bottom but we decided to put ours on the side. This way, Chloe can open the door and stand in front of the stove while she puts things in and pulls things out. We also thought the bottom hinge might mean the door could fall open more easily and slam on Chloe's feet - a definite no no. We put a magnetic latch and Chloe has easily learned how to open the door with a little tug. 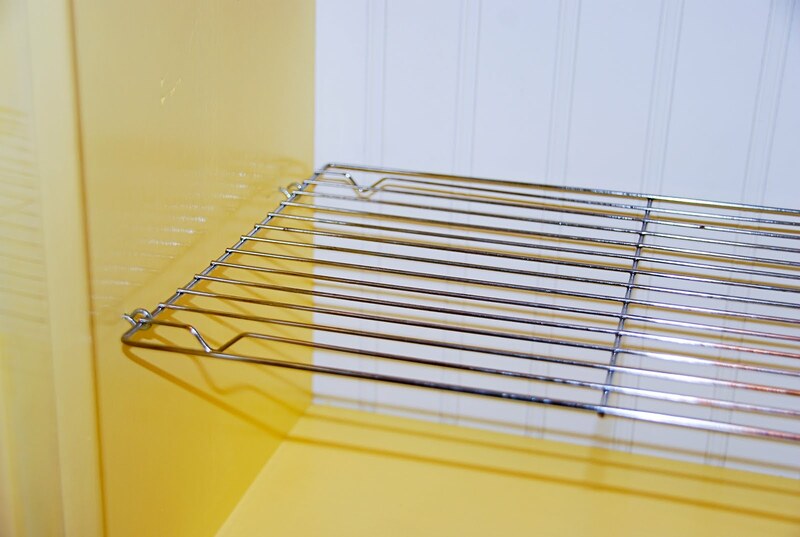 We were struggling with the inside of the oven - I really wanted a pull-out shelf that would mimic the movement of a real oven rack. Unfortunately, the slide mechanism would get in the way of the oven door so we had to find another solution. Cleaning up after dinner one day, I came across a great compromise - we could use a cooling rack that looked like a real oven rack. I just happened to have one that was the perfect size! We held it in place using four eye hooks. To add to the realism, I decided to put a push-on LED light in the stove. And here it is, in use, as Chloe bakes a cake! It's amazing!! I had a fisher price kitchen as a kid and it was my absolute fave. I'm sure Chloe LOVES it!! That is super cute. Love all the details. That is by far the cutest little kids play room I have seen! Love the colors! This is ADORABLE!!! Chloe is going to have hours of fun! The other thing we learned with the sink was to cut the hole from the top. We measured and cut from the underside, (not sure why we did this but it made sense at the time) but the jigsaw blade bent and angled a bit during cutting and made the hole out of shape when you turned the counter over. oh yeah.. we attached the bowl to the counter with big globs of PL Contractors Adhesive from the underside. It took a while to harden (like a week or two) but now its hard as a rock and the bowl will never come out. How adorable. I'm sure she's loving it. I LOVE IT- it is amazing. Good Jobbie! i love it to bits! No WONDER you are ridiculously proud of yourselves. That thing is absolutely adorable. What care and attention to detail you put into it. She'd better cook you up something fancy as a thank you. Loving the retro look.... ridiculously cute. ok that is the cutest thing! i love it, and all the fABUlous detail! Turned out super great!! I am sure Chloe loves it :) You are such a great mother!! She is one lucky girl! Looks awesome! OMG, this is TOO cute!!!! My girls are all grown now, but I would of LOVED to make this for them. GREAT JOB!!!! 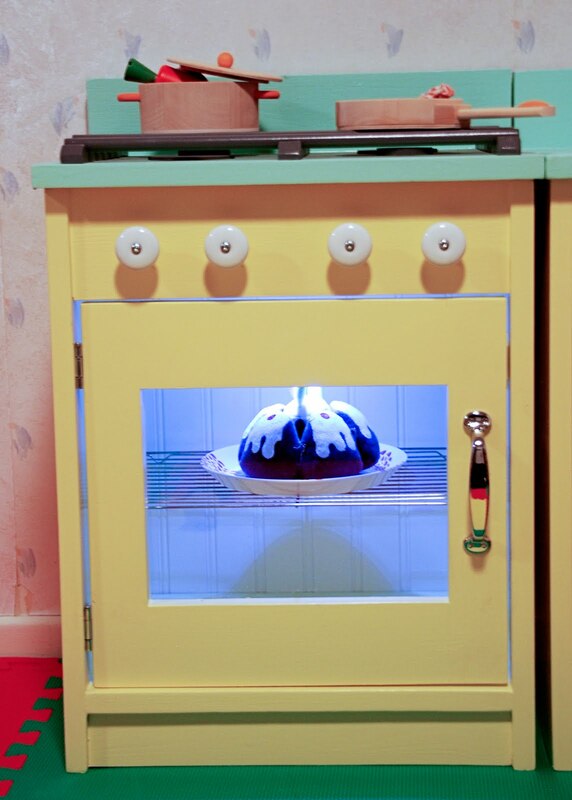 Love the light in the oven great idea. It all looks super! And real. -- Which you'd better watch out for BTW. Teach her at the getgo to USE her oven mitts and to "turn" things off first. And to check if anything is "warm" or "hot". I know it's all make-believe, but it could mean a big deal if she ever "accidently" touches anything around the REAL stuff! And we all know how quickly she took to "cleaning"! If she does the same with "cooking" - best that she learn the safety bits even WHEN pretending! ;-] Wished my TAPS looked so good! Lucky kid! That is so cute. I loved buying plastic food for my kids to play with and pretending to have picnics with them - such fun. Your daughter is going to love that for years. That is amazing! I think your little food kit would look fantastic with some knitted cupcakes! Wow, the play kitchen is incredible! Hmmm, maybe one day it will be passed along to Chloe's kids. So darn cute! Love all the "real" accessories! 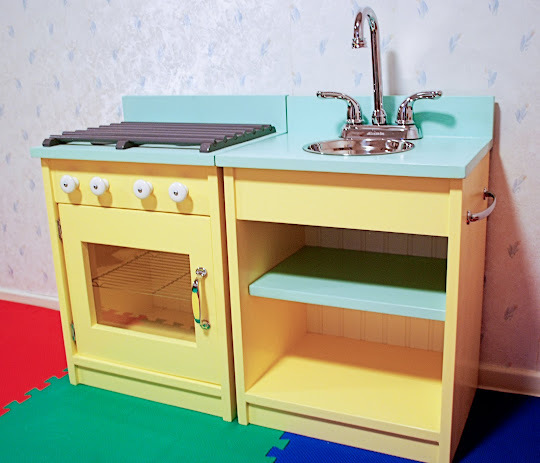 My Dad made my sisters and I a kitchen like this (not in such lovely colors, but it was 47 years ago!). My sisters and I would have fought each other to the bitter end to have the thing in our homes, so instead,the grandkids play with it at grandparents house. A real heirloom. Yours is beautiful and your daughter is lucky. I am going to mention you on my blog tomorrow. 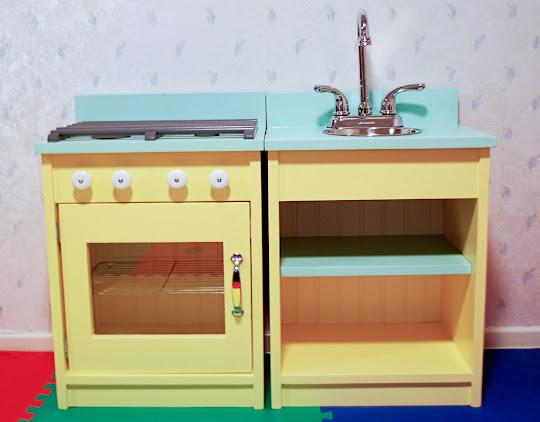 I absolutely adore the play kitchen,,my girls would fall over in excitement if I put my power tools to the test!! Perhaps i will!